Atoll is a 64-bit multi-technology wireless network design and optimisation platform that supports wireless operators throughout the network lifecycle, from initial design to densification and optimisation. Atoll includes integrated single RAN – multiple RAT network design capabilities for both 3GPP (GSM/UMTS/LTE) and 3GPP2 (CDMA/LTE) technology streams. It provides operators and vendors with a powerful native 64-bit framework for designing and optimising current and future integrated multi-technology networks. Atoll supports multi-technology HetNets, small cell planning, and Wi-Fi offloading. 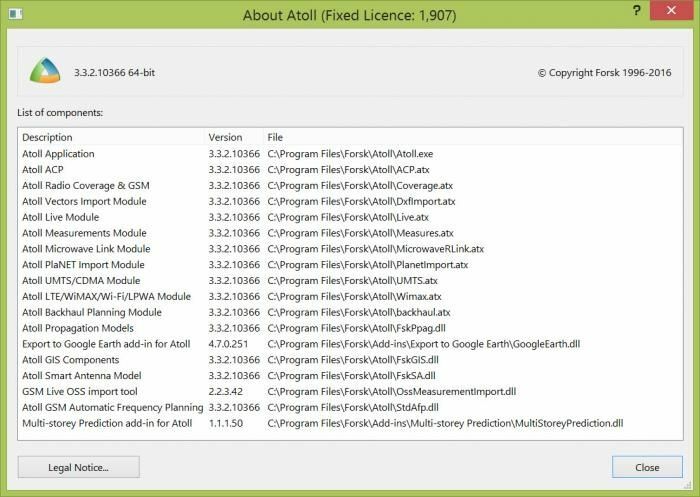 Atoll 3.3 new Live module allows integrating live network measurement data such as KPIs and UE/MDT (minimisation of drive tests) traces with predictions and adds open-loop SON capabilities to Atoll. Atoll’s integration and automation features help operators smoothly automate planning and optimisation processes through flexible scripting and SOA-based mechanisms. Atoll supports a wide range of implementation scenarios, from standalone to enterprise-wide server-based configurations. With more than 6500 active licenses installed with 450+ customers in 115 countries, Atoll has become the industry standard for radio network planning and optimisation. Thank for your sharing my brother, do you have atoll with IOT version? Hey Bro, thanks for sharing. but the .rar file asking for a password? may i know the password, please? huuthuan wrote: Atoll is a 64-bit multi-technology wireless network design and optimisation platform that supports wireless operators throughout the network lifecycle, from initial design to densification and optimisation. Chunl1 wrote: Thank for your sharing my brother, do you have atoll with IOT version? Ridho wrote: Hey Bro, thanks for sharing. i am sorry but there not a message in my inbox. can u resend the password? can u help me please? Please help me, need password. Hi, may I get the password for the file ? sorry sir, may i request the password. Sir, Can u share password?